Criticizing renewable energy has become somewhat of a social taboo in recent years. After all, the 100% renewable energy ideal is ideologically extremely attractive and two decades of highly subsidized double-digit growth rates have created the illusion that this ideal is well within reach. It is important, however, that proponents of renewable energy also consider the risks involved in their vision. As this article will attempt to demonstrate, there is a definite risk that the heavily subsidized deployment of currently available renewable energy technologies will cause the very effects it attempts to prevent: continuously escalating CO2 emissions and poor energy security. Even though this possibility might appear inconceivable to some, it is a very logical consequence of the consistent forcing of energy technology that is, as of yet, fundamentally unable to sustain our complex modern civilization. The most important point to be conveyed in this article is the following: A highly developed society requires high quality energy resources and complex renewable energy systems require a highly developed society. Let’s take a closer look at this statement. The hierarchy of energy needs can again be used to illustrate the first part of this statement. 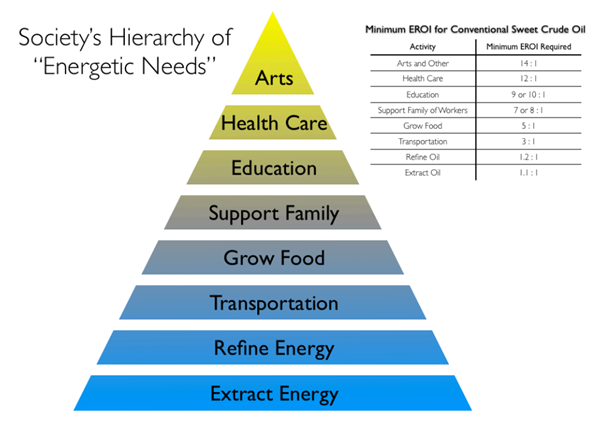 As shown below, Energy Return on Investment (EROI) requirements increase significantly as a society becomes more complex and starts using its energy for more advanced purposes. For perspective, solar PV with only 4 hours of battery backup currently has an EROI of around 2:1, implying that massive technological advancements are still required before solar PV can even be considered as a major energy source. An EROI of 2:1 implies that half of all energy will have to be invested into getting new energy, implying that roughly half of all labour (and GDP) will be in the energy sector. For advanced societies, this is simply out of the question. 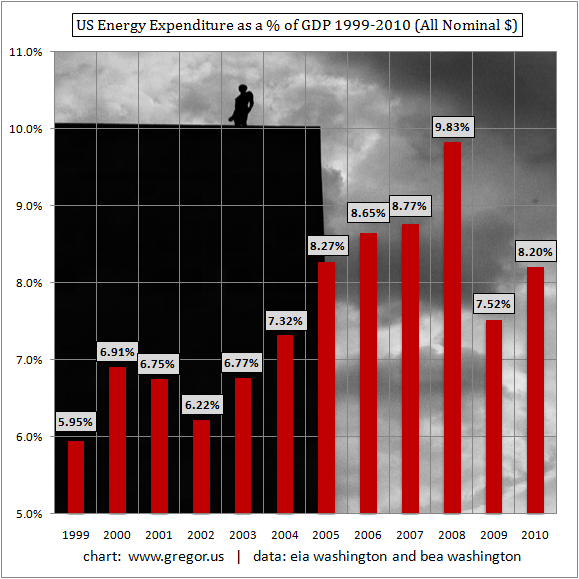 As an example, according to peak oil theory, the US economy crashes when energy costs consume more than about 9% of GDP. Another very important point to consider is that solar and wind power demands virtually the entire energy investment up-front. To understand the practical implications of this constraint, imagine the growth of solar power with battery backup in an isolated environment where all the energy generated by this system is used to manufacture new units. If the system has an EROI of 2:1 and releases its energy linearly over a 30 year lifetime, it means that the first system will only generate enough energy to make another system after 15 years. This is obviously not a very healthy situation for growth. On the other hand, if the energy return could be used (and reinvested) almost immediately, very rapid growth becomes possible even at a low EROI. This immediate energy return on investment is one of the main reasons why fossil fuels allowed the global economy to expand by a factor of 50 in the 150 years since the second industrial revolution. To account for the large up-front energy investment demanded by solar panels, wind turbines and the associated storage and balancing infrastructure, a discount rate must be applied to future energy. Over a lifetime of 30 years, a 5% discount rate would change the 2:1 EROI to 1.05:1, clearly illustrating the amount of progress still needed before these technologies can sustain our modern civilization. Regarding the second part of the above statement, it must be recognized that the high-tech nature of renewable energy generation and balancing requires a very advanced society with an abundance of highly educated scientists and engineers. For example, the process of constructing and installing a 5 MW wind turbine with a 130 m blade diameter 50 km offshore really is a true engineering marvel, requiring a large and multifaceted team of highly educated (and highly paid) experts. So would be the integration of a wide array of intermittent and non-dispatchable renewable energy sources into our existing power grids. If a society is not sufficiently advanced to yield (and sustain) such experts in very large numbers, renewable energy simply cannot work. The fundamental problem therefore becomes very clear: renewable energy requires highly educated experts in large numbers, but the energy return offered by currently available technologies cannot sustain the highly advanced society necessary to meet this requirement (not by a long shot). It is important to note, however, that this very fundamental problem will not become apparent as long as renewable energy remains a marginal source (see below). 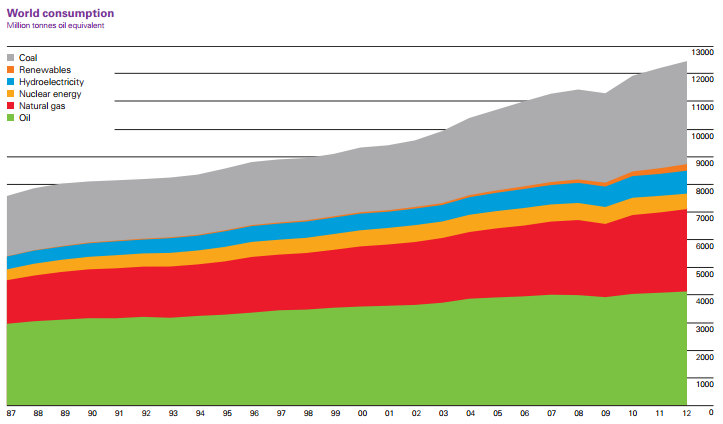 At this point, where wind and solar supply 0.95% and 0.16% of global energy respectively and intermittency is not yet much of a problem, deployment can still continue in spite of the fundamentals. It is only at higher levels of penetration that some delayed negative feedback is received. Germany offers a very good example. In 2012, wind and solar contributed 13.2% of Germany’s electricity supply (although import/export balances below reveal that this is more like 7% of the electricity of Germany and its closest neighbours). Up to last year, things were progressing very well, but the high and steadily rising electricity bills have very quickly brought the costs of the Energiewende to the centre of the political stage. Unfortunately though, these high prices have been locked in for decades by long-term feed-in tariff agreements. This implies that Germany is committing itself to high energy prices for the long run and, with every additional installation, the weight of this commitment increases. As the Euro crisis drags on and German GDP-per-capita continues stagnating, this can become a major problem. Yes, Germany is a highly industrious nation and has enjoyed great economic benefits from the formation of the Euro, but even the Germans remain bound by the laws of physics. A more subtle threat posed by this delayed negative feedback effect is that governments have not only subsidized a large amount of construction capacity into existence (e.g. 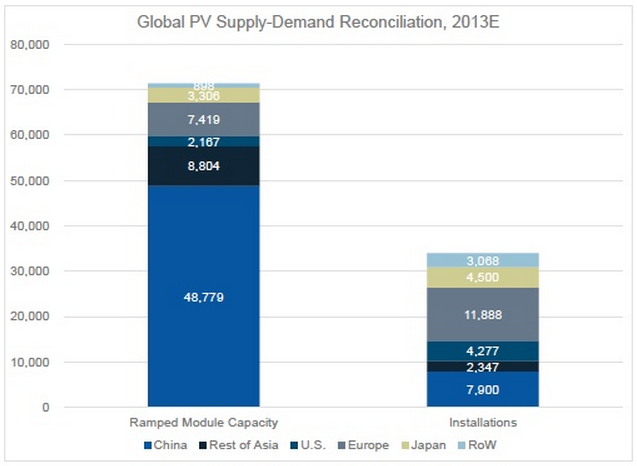 the massive solar PV overcapacity shown below), but also a strong lobbying group which demands continuation of the heavily subsidized rollout at almost any cost. As a result, it seems like world is on track to subsidize the deployment of low quality energy sources to the point where the economy simply cannot take it anymore. At this point, the economy will have to contract, thereby creating a vicious cycle which ultimately ends with retroactive feed-in tariff cuts, massive wealth and job destruction, and an unbalanced electricity grid with an oversupply of intermittent sources. Spain is a good example of this situation. The sum total of this scenario will be trillions in failed investment over a period of decades without having any meaningful impact on the carbon intensity of global energy systems. From a climate change perspective, this will be nothing short of a global tragedy. Finally, it is important to acknowledge the possibility that external factors like unpayable debt levels, aging populations, increasing social inequality and structural unemployment could perpetuate or even worsen the seemingly never-ending economic stagnation in the developed world. If central banks lose control of this very delicate system, any nation with a substantial long-term commitment to low-quality renewable energy sources would suddenly find itself in a highly compromised position. It is impossible to predict with certainty whether such a situation will or will not materialize, but it is important that this possibility is acknowledged. For this reason, the next article will discuss this issue in a little more detail.